Herd sires available for viewing on the 'Herd Sires' page. Introducing - "Roll the Dice"
What do Shoeless Joe (West Texas Genetics), Double Time (Top Cut) and the numerous Double Time sons at prominant boar studs all have in common with his guy? They're all out of, or a littermate to, this guy's materal grand dam. 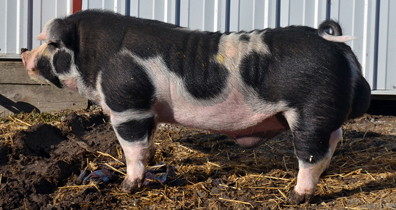 One litter created at M&N Showpigs may very well influence every spotted herd in America by the end of this decade. Or...if you prefer more of an old school vibe, this boar has 10+ shots of the famous B&B boar in him.